Ever innovative, Google has taken a further step away from its prosaic roots. It unveiled today in Korea a new version of its home page that features animation and looks far less plain than its massively successful predecessors. The news came in a speech by Google's CEO, Eric Schmidt , at the Seoul Digital Forum in Korea (video of the speech available by clicking the 'On Air' button). During the speech he explained that the new look would appear elsewhere soon. 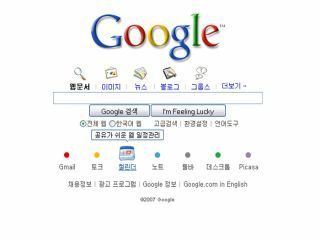 Currently available only in the Korean language, the new search page looks far more attractive than the cluttered mess of the personalised pages Google currently offers around the world. There is now a row of icons for various Google services that animate when pointed at. These icons link to Gmail, Picasa, Google Calendar and other Google-branded tools. The move adds little in terms of functionality. But the changes to the page represent a significant departure from the original Google 'keep it simple' ethos that helped the search engine grow in the pre-broadband era.